Paper-free processes improve productivity and lower costs, but the biggest impact is on speed of response - response to inbound mail, response to bottlenecks, response to regulatory changes, but above all, response to the customer, citizen or client. 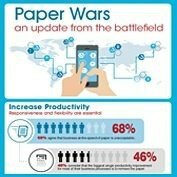 Business-at-the-speed-of-paper will be completely unacceptable in a few years’ time. See the heads-up survey numbers and recommendations in this useful infographic.